This Ninja Baker was delighted to receive a gift box of gluten-free Glutino  goodies. All opinions are my own. In the late 1970s, in the USA, fretting Mothers frantically figured out ways to create tasty gluten-free sandwiches for their children’s school lunches. Why? GMO (genetically modified organisms) wheat (and corn) were introduced to the American public. And made our children’s immune system sick and sensitive to products like wheat. Side note 1: In places like Japan GMOs are banned. Side note 2: In an experiment, it was discovered that animals instinctively avoided food with GMO. Fast forward in time: Smart companies like Glutino who are sensitive to the needs (and taste buds) of gluten intolerant kids started manufacturing gluten-free goodies. Today, Moms and Great-Aunties (like yours truly) can create super yummy gluten-free bento box lunches for school and work. I’m lucky there were enough pretzels and cookies for my photo shoot. My husband’s go-to snack is a bowl of Glutino pretzels and a bowl of mustard. A serving of Glutino Chocolate Crème Cookies follows the savory gluten-free goodies. (One bite and you may never touch another Oreo again. They are that good! For reinforcement of high marks, here’s a very rewarding rich gluten-free chocolaty cupcake. Decorate as you wish. With Mandarin orange slices and orange gumdrops I created flowers. Love to see how you food-style your gluten-free bentos and cupcakes. Luscious chocolate blends with orange flowers which blossom exquisite deliciousness. Rich, chocolaty, gluten-free cake goodness could not get much better! Add cake mix at medium speed. When crumbly, crack open the eggs and drop in one at a time. Next, incorporate the Greek yogurt until well combined. Divide the batter between 12 cupcake cases in a muffin. Frost with your favorite vanilla frosting. Cut the mandarin orange segments. Place one orange gumdrop in the middle. 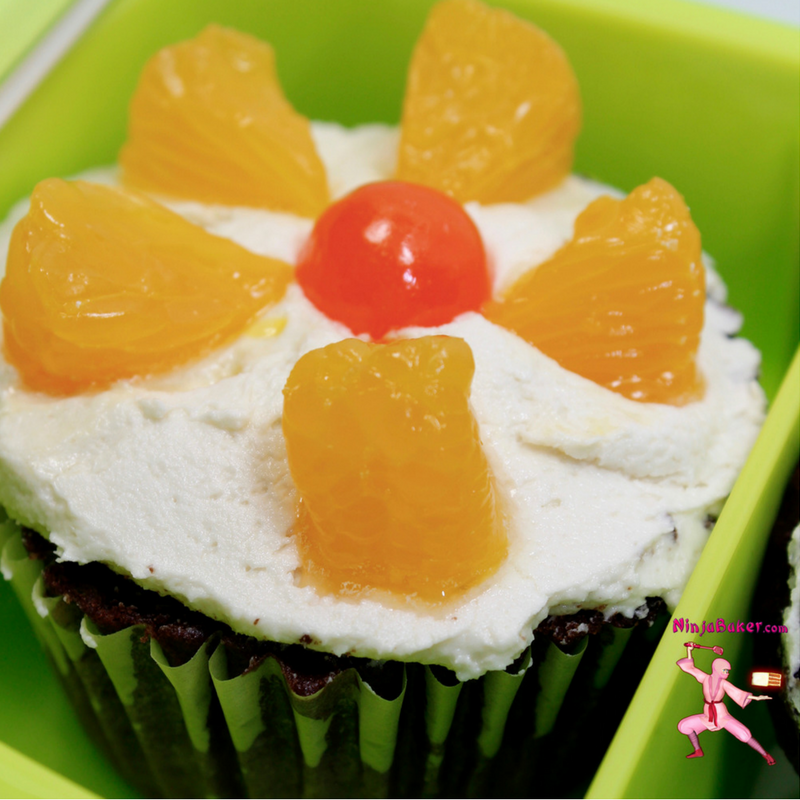 Surround the candy with the Mandarin orange segments to create flowers. Wishing you high marks in happiness. 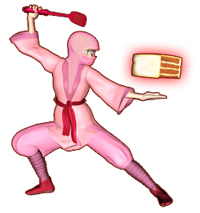 The Ninja Baker has guest blogged and contributed recipes to numerous food sites. These additional recipes can be found here .